In November this year I received a number of reports of Common Crossbill from a range of forested areas mainly in the south of the island including Clauchan Glen, Corriecravie, Dippen, Machrie and Whiting Bay. The largest group was thirty-seven in Machrie Forest on 19 November. This was in marked contrast to the previous two Novembers when in total only one Common Crossbill record was received. Common Crossbill are an irruptive species and may be more numerous and widespread in some years, reflecting the availability of their food. They are also a species that is easily overlooked. Common Crossbill is a chunky looking finch. Adult males tend to be red or orange in colour, and females green or yellow, but there is much variation. 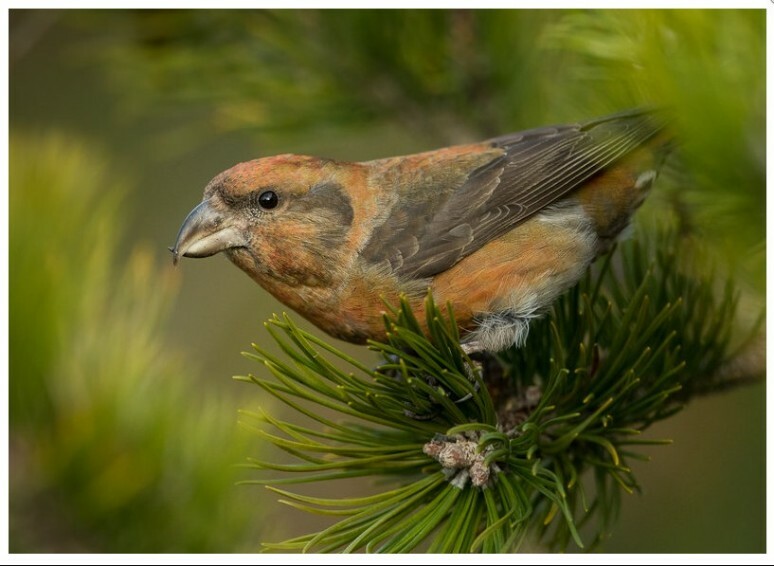 The Common Crossbill is quite common on Arran particularly in areas of man-made pine forests. As its name suggests, the tips of the bill cross, enabling the birds to extract seeds from pine cones, their principal food. They are most often encountered in noisy family groups or larger flocks, usually flying close to treetop height. Common Crossbills feed acrobatically, fluttering from cone to cone and at times hanging upside down. It is always exciting to watch a flock of Common Crossbills. The crimson or brick-red males may sing and chatter as they move through the treetops. When lost to view, all you will hear are cones tumbling from branch to branch as seed cases spiral to the forest floor. Common Crossbills range across much of Europe and northern Asia, as far south as the North African Barbary Coast. Periodically, the UK population is boosted by ‘invasions’ of birds from northern Europe, when the pine cones have failed there. Common Crossbills have one of the most protracted breeding seasons of any British bird. It can begin as early as January and, in parts of their range, they have been recorded breeding in every month of the year. The availability of cones is the main stimulus for breeding. Up to four greenish-white, lightly-blotched eggs are laid, and incubated solely by the female. After 13 days, the eggs hatch and both parents take part in feeding duties. Young have been known to leave nests before mid-January. Thus on occasions, eggs must have been laid a week before Christmas. End-of-year nesting may well include young breeding in the same year in which they were born. Look out for these noisy, colourful finches in Arran’s forests.